Very good little book for an introduction to medieval castles, covering what it was like to live in them from lots aspects; hygiene, hunting, fighting, social activities, purpose and environment etc. It doesn't go into archaeology or architecture (aside from a mention of types of garderobes), but it's a nice bit of background that you can build upon with other books and sources and a quick read if you don't have long or attention span. Fun and short read but still interesting. Full review to come shortly.+++++++++++++++My book blog ---> http://allthebookblognamesaretaken.bl...**This is a double review of both Life in a Tudor Palace and Life in a Medieval Castle**These are such brief reads that I can hardly write a full review, so I am reviewing them together. That is not meant to be disparaging however, because these are simply slim volumes that focuses on a very specific part of history - Tudor palace life and medieval castle life. I really enjoyed these one for what they were, brief glimpses at history. One of the only things I will say negatively is that both books would have done better had there been illustrations to go along with. This would have been helpful for those of us not familiar with the layouts of the buildings.I took issue also with a statement from the medieval castle book where the author said reading and writing were typically left for girls. This seems strange, as men were expected to be able to do those things in order to conduct their business. Some educators even thought that reading was too taxing on the brain for women, so...Ending on a positive note, I love that this short little medieval castle book gives a shout out to William Marshal, one of my medieval heroes. Lately I have read much longer books dealing with that period of time and this great knight gets no mention at all. Yet here his name pops up and I was glad to see it.Recommended for anyone even with a slight interest. These are quick reads, still packed with tons of interesting information. An interesting and informative little book. Each chapter covers and aspect of life in Medieval England and would make a good reference book for a young person studying the subject. As usual throughout history the men seem to have the better deal in life whilst women are simply there to have children and be bartered in marriage for the best deal. Children are not children as we would see them today but simply small adults, they were dressed in the same way as their parents and were expected to grow up quickly and learn how to behave according to their station in life. Boys were sent to neighbouring houses to learn how to become squires and maybe knights, girls were taught how to sew, entertain their husbands and guests by playing musical instruments and singing and how to run a household. If a child was lucky enough to survive the early years they would marry young and have their own children as soon as possible and as many as possible to secure the inheritance of their property. Life expectancy was about 25 years of age! An instructive little book - great introduction to the subject. 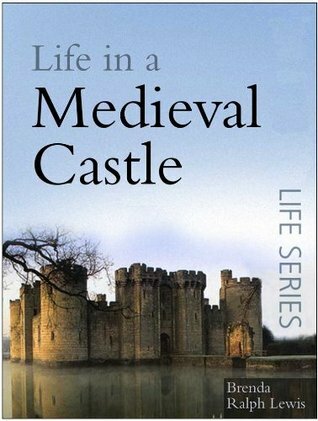 There are of course quite a few books with the title, Life in a Medieval Castle. Brenda Ralph Lewis' version may not necessarily be the longest or most in depth on this particular subject, but I found it to be a very well written and quite comprehensive book, all the same. In fact, I would argue that this entry in the Sutton Life Series is just the right length for most readers. The author deftly gives numerous, highly interesting anecdotes and actual historical examples to illustrate her overview of medieval court life, so all the otherwise dry factoids come alive a great deal more than in similarly titled volumes. Thus, this version of Life in a Medieval Castle is highly recommended reading for anyone with even a casual interest in the Middle Ages or European (mostly British) history in general. It's a short little book, but it tells enough to be interesting. It included little details about daily life in a castle that I never would have thought. Like, anyone who wasn't a lord didn't have a regular place to sleep, and they had to bed down on the floor of the Great hall or wherever they could find a place. Even trained knights had to sleep where they could. That surprised me. And there are lots more little things that I was interested to learn. This book piqued my interest and I'd like to read more on the topic. Pretty interesting and fast read. I am not sure of the complete accuracy as it contradicts some of descriptions of life as written by Marc Morris whom I completely enjoy. Very informative and interesting. Good read for a younger audience. Brenda Ralph Lewis - Brenda Ralph Lewis is a writer with over 200 books on history and numerous magazine articles and television documentaries to her name. Her fascination with Scottish history and culture began early in her career and she has since returned to the subject at every opportunity. She regards [her] book on tartans as a labor of love.